The General ticket allows you access Barcelona Beach Festival on the 13th of July 2019. The Premium Ticket allows you access Barcelona Beach Festival on the 13th of July 2019. 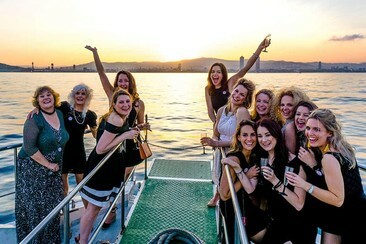 Whether you want a glamorous pre-party or a luxurious evening on the water, the Champagne Sunset Cruise Party will fulfill your needs. Treat yourself to something really special… this one’s a Barcelona must! Get seriously glammed up for an evening of champagne cocktails and chilled beats. 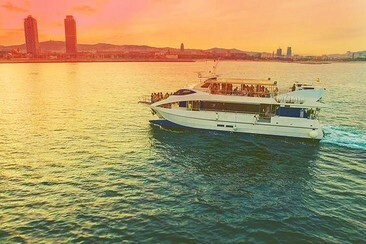 Our live musicians will entertain you as you cruise along the Barcelona coastline at sunset aboard a stunning white catamaran. Our chefs have whipped up some truly scrumptious Spanish paella for you to enjoy whilst you take in the stunning views, wind in your hair and fine company to share it with. Set in front of the beach, Camping Tres Estrellas is located in Gavá, 15 km from Barcelona. The property offers simple rooms and air-conditioned bungalows in a camp site with a swimming pool. The camping includes a mini market, bar-restaurant and disco. 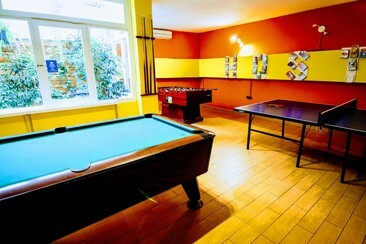 Guest can also enjoy in the shared areas the BBQ facilities, washing machine and games room. Free private parking is available. The property is set within the Delta del Llobregat Nature Reserve. Guests can find the town centre of Gavá and Castelldefels within 8 km of the property. Barcelona Airport is 4 km away. The tent pitches are located in the central area of the 3 Star Camping, in a pine environment and with access to the beach. A privileged natural area very close to Barcelona. Your best summer proposal! Set in front of the beach, Camping Tres Estrellas is located in Gavá, 15 km from Barcelona. The property offers simple rooms and air-conditioned bungalows in a camp site with a swimming pool. The camping includes a mini market, bar-restaurant and disco. Guest can also enjoy in the shared areas the BBQ facilities, washing machine and games room. Free private parking is available. The property is set within the Delta del Llobregat Nature Reserve. Guests can find the town centre of Gavá and Castelldefels within 8 km of the property. Barcelona Airport is 4 km away. The Coco Home for those who want the contact with nature and the comfort of a bungalow. The Coco Home has bedrooms, a small office and an outside terrace. Located in a pine area and with direct access to the beach a great natural experience! Set in front of the beach, Camping Tres Estrellas is located in Gavá, 15 km from Barcelona. The property offers simple rooms and air-conditioned bungalows in a camp site with a swimming pool. The camping includes a mini market, bar-restaurant and disco. Guest can also enjoy in the shared areas the BBQ facilities, washing machine and games room. Free private parking is available. The property is set within the Delta del Llobregat Nature Reserve. Guests can find the town centre of Gavá and Castelldefels within 8 km of the property. Barcelona Airport is 4 km away. The Venus bungalows are part of the classics. Comfortable and fully equipped accommodation for up to 4 people, located in the central area of the campsite. The natural environment full of pines and the proximity of the sea will turn your vacations into unforgettable moments. 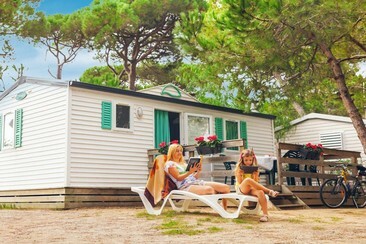 Set in front of the beach, Camping Tres Estrellas is located in Gavá, 15 km from Barcelona. 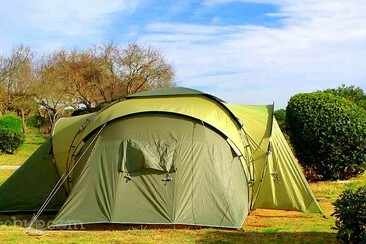 The property offers simple rooms and air-conditioned bungalows in a camp site with a swimming pool. The camping includes a mini market, bar-restaurant and disco. Guest can also enjoy in the shared areas the BBQ facilities, washing machine and games room. Free private parking is available. The property is set within the Delta del Llobregat Nature Reserve. Guests can find the town centre of Gavá and Castelldefels within 8 km of the property. Barcelona Airport is 4 km away. 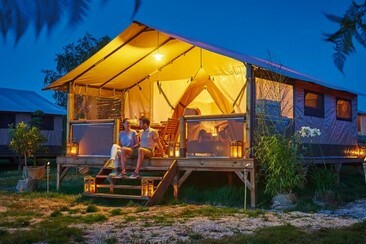 From the junction of «camping» and «glamor» comes «glamping», an idea that reconciles comfort with camping in the open air. The Eco Mobilhome Victoria with 2 bedrooms and a fantastic terrace is designed and equipped so you do not give up anything. It is located in an area of pines and a few meters from the beach. Set in front of the beach, Camping Tres Estrellas is located in Gavá, 15 km from Barcelona. The property offers simple rooms and air-conditioned bungalows in a camp site with a swimming pool. The camping includes a mini market, bar-restaurant and disco. Guest can also enjoy in the shared areas the BBQ facilities, washing machine and games room. Free private parking is available. The property is set within the Delta del Llobregat Nature Reserve. Guests can find the town centre of Gavá and Castelldefels within 8 km of the property. Barcelona Airport is 4 km away. 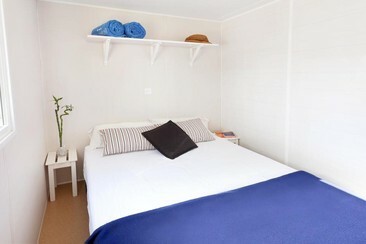 The Bungalow Dalí is part of our new spacious and bright accommodation with capacity for up to 4 people. Fully equipped, our bungalows bring together the comfort and comfort of a home, in an exceptional natural setting, just a few steps from the beach. Turn your stay into pleasant moments to remember. 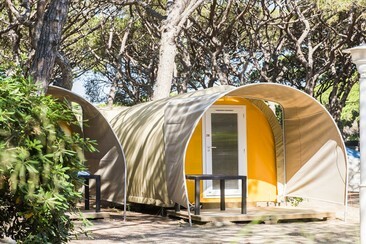 Set in front of the beach, Camping Tres Estrellas is located in Gavá, 15 km from Barcelona. The property offers simple rooms and air-conditioned bungalows in a campsite with a swimming pool. The camping includes a mini market, bar-restaurant and disco. Guest can also enjoy in the shared areas the BBQ facilities, washing machine and games room. Free private parking is available. The property is set within the Delta del Llobregat Nature Reserve. Guests can find the town centre of Gavá and Castelldefels within 8 km of the property. Barcelona Airport is 4 km away. 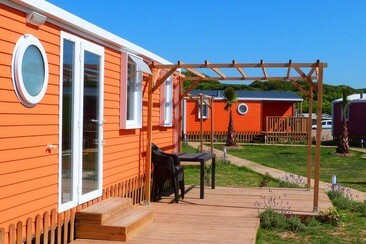 Enjoy the new and bright bungalows for up to 6 people, in a unique natural setting on the seafront. The comfort and convenience of a home, fully equipped, and with all the services join the contact and freedom to live outdoors. Yellow Nest Hostel is located in Barcelona’s Les Corts district, just 3 minutes’ walk from FC Barcelona’s Camp Nou Stadium. It offers a large TV room where you can play a pool, darts and ping pong. 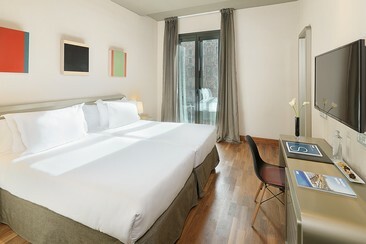 The air-conditioned dormitory rooms at the Yellow Nest feature simple, colourful decor. The guest house serves a daily buffet breakfast. There is also a communal kitchen for guests’ use, as well as vending machines for snacks and drinks. 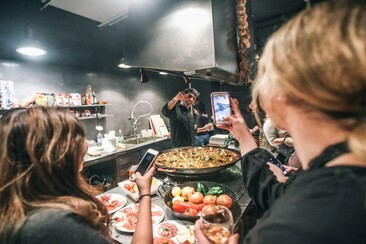 Staff at the 24-hour reception can provide information about what to see and do in Barcelona. You can walk to Badal Metro Station in 5 minutes, which takes you to the city centre in under 15 minutes. Just located 500 metres from the fashionable Passig de Gracia Avenue, Generator offers both private and dormitories which have air-conditioning, heating as well as individual power sockets and reading lamps for each bed. Guests have access to free private lockers and free Wi-Fi internet access in public area and the hostel has a communal lounge with computers to use at a charge as well has a luggage storage service. The hostel's reception is 24 hours with multi lingual staff available to help with the accommodation or anything in the surrounding area. A choice of authentic and locally source food is available as well as vending machines for snacks for anytime of the day. Diagonal and Verdaguer metro stations are within 5 minutes’ walk from Generator Barcelona. The Gràcia district, which has plenty of boutique shops and bars, is only 200 metres away. 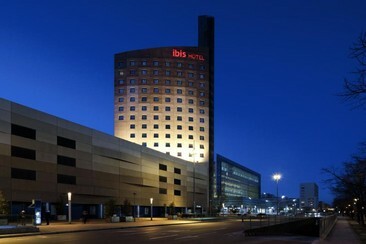 The Hotel Ibis Meridiana in Barcelona on Av. Meridiana, a 5-minute walk from metro lines L1 and L4 which offer direct access to the historic center and beaches. Good transport links with the airport and the Sants train station. Next to the hotel you will find a commercial area with an outlet center, El Corte Inglés department store and a leisure area with fitness center, cinemas, restaurants and swimming pool. Indoor paid public car park available. The hotel has free WIFI. The ibis breakfast is an 'all-you-can-eat buffet' served between 6.30 and 10AM, combining all the elements of a traditional continental breakfast. Located next to Rambla de Catalunya, Barcelona’s main shopping and cultural area, is HCC Taber, a hotel with Modernist architecture designed by one of the most famous architects of this artistic movement: Lluís Domènech i Montaner, who also designed Palau de la Música among many other buildings. The rooms at HCC Taber feature satellite TV and a minibar. The private bathroom includes a hairdryer and free toiletries. The hotel’s buffet breakfast offers a wide range of dishes, and there are à-la-carte breakfast options. There is also a snack bar and room service. The Ramblas are just 10 minutes’ walk from the hotel, and Gaudí’s iconic Casa Batlló and La Pedrera are also within a 10-minute walk. Airport buses leave from Plaza Catalunya. Conveniently located a 5-minute walk from Barcelona's main train station and Sants Estació Metro Station, this 4-star hotel gives great transportation links reaching the centre within 10 minutes on the Metro. The property has 140 guest rooms fitted with a safety deposit box, minibar and air-conditioning. Guests can enjoy traditional Basque specialities at the Amalur Restaurant. 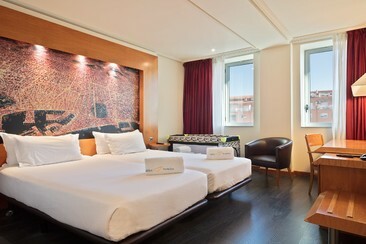 The Abba Sants has a 24-hour front desk and offers free WiFi in rooms and public areas. You can hire a car at the tour desk, and parking is available nearby for an additional charge. 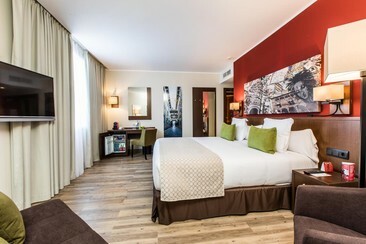 The Holiday Inn Express Barcelona City-22@ hotel is a short walk from Mar Bella beach in Barcelona's dynamic new 22@ district. The hotel offers simple and contemporary décor throughout with 186 spacious guest rooms all with air-conditioning, tea/coffee making facilities and free Wi-Fi access. The hotel serves a breakfast of cold meats, cheeses and pastries, and there is also a cozy lounge where guests can relax in the evening. The Barcelone El Prat Airport is only a 30-minute taxi ride from the hotel, and the Llacuna metro station, with direct links to famous sights including Gaudí's dramatic Sagrada Famíla, is only a few minutes away. 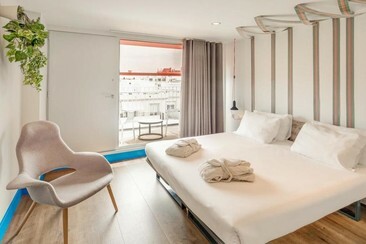 The hotel is a stone's throw from the lively Rambla de Poblenou, where guests can dine on seafood and local Catalan dishes, or sunbathe on the nearby Mar Bella and Playa del Bogatell beaches--both are under 15 minutes walk from the hotel. 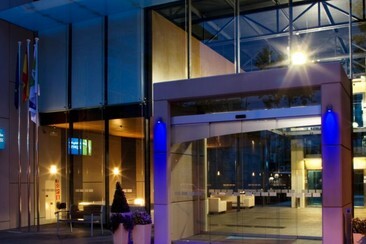 The Leonardo Hotel Barcelona Gran Via is situated in La Nova Esquerra de l' Eixample, a perfect location between Plaça España and the heart of the bustling metropolis. Sants - the nearest station, can be reached by car in just 7 minutes, and by public transport or on foot in 15 minutes. Guestrooms feature flat-panel TVs with satellite channels and complimentary wireless Internet access, minibars, direct-dial phones, and in-room safes. Bathrooms provide hairdryers, makeup/shaving mirrors, and complimentary toiletries. 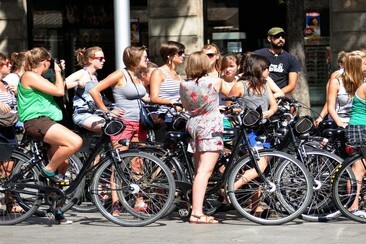 Stoke Travel’s bike tour is an unforgettable chance to spend a half-day exploring the best attractions in Barcelona. Ride through the city at a relaxed pace, stop frequently at the best monuments along the way. You will have a beer or two during the tour. *Please note: Tours may not run if less than 5 people. Experience Barcelona in your own way! Get around freely with the Hola Barcelona Travel Card which provides unlimited journeys on public transport in Barcelona. Start using your Hola Barcelona Travel Card at any time of day and take advantage of unlimited journeys for 48, 72, 96 or 120 hours from the first time you validate it. Hola Barcelona Travel Card is a non-transferable travel card that allows you make as many journeys as you like using the metro, bus (TMB), urban railway (FGC, Zone 1), Montjuïc funicular, tram (TRAM), and regional railway (Rodalies de Catalunya, Zone 1). Unlimited journeys on public transport! Green Bikes supplies bicycle for its many self-guided tours, along with supplies, equipment and all the assistance you will need to explore on your own or with your family and friends. All rentals come with high-quality LOCKS to make sure the bikes are not stolen. We will show you how to use the locks correctly as part of the rental process. Barcelona Beach Festival is a huge electronic music festival, featuring some of the mainstream's biggest stars. 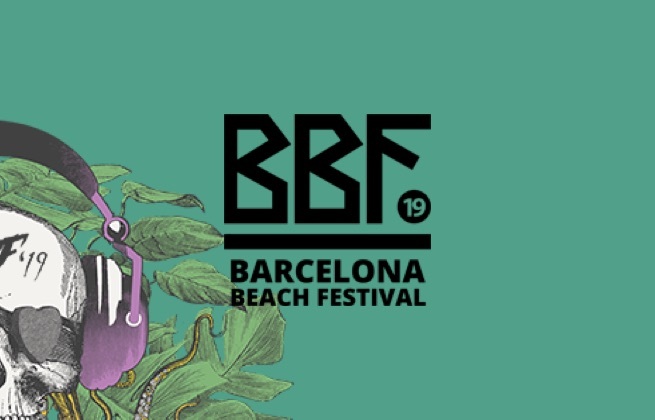 As the name suggests, BBF takes place on the sands of the world-famous coastal city, transforming the Platja del Fòrum into one of Europe's wildest party spots for over 12 hours. The stacked lineup of dance music giants is matched by the investment in production, with the imposing single stage rising high above the beach complete with enormous soundsystem and an array of special effects to make things go off with a bang.